Delightful cookie fingers of anise, delicious carob bites, and a hint of lemon. Anise is a great digestive spice so this makes a great dessert. Try with green chai or mint tea. 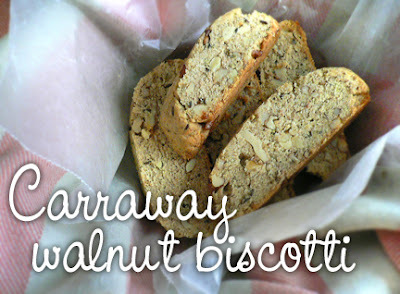 Or, for a deliciously savoury variation, Carraway Biscotti with Walnuts below! Combine the flour, baking powder, and salt in one bowl. In a separate bowl, beat the sugar and margarine, adding the eggs one at a time. Add the whole and ground anise plus lemon zest and mix well. Add the flour mixture and beat just until blended. Stir in the carob chips. Form the dough into a log 16 inches long and 3-4 inches wide (it'll be about 1-2" high). Transfer the log to large baking sheet, either lightly oiled or lined with parchment paper. Shape into a smooth form. Bake about 30 minutes* or until light golden. Cool 30 minutes. Then gently place the log on a cutting board, and using a serrated knife, cut the log on a diagonal into slices 3/4-inch thick. Arrange the cookies cut side down on the baking sheet. Bake the cookies at 300 until pale golden, about 10 minutes. 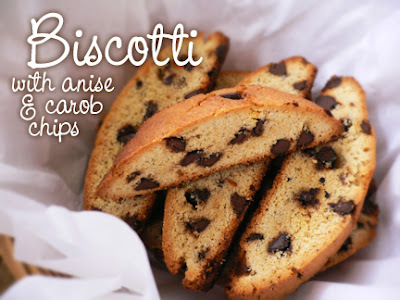 For crunchier biscotti, flip and bake 10 minutes longer (don't let them get too brown, though). Transfer the cookies to a rack and cool completely. Makes 2 dozen. Proceed as with anise carob recipe. NOTES: If halving the recipe, reduce baking time to 20 minutes. If using a non-wheat flour, carefully cut the slices 1-inch thick so they don't crumble. ayurveda is against eatin eggs and onions!! didn't you know that?!? My sources show that onions (and garlic) are appropriate in an ayurvedic diet, though I have indeed heard that some followers are against them. My layman's conclusion is that onions and garlic are good when eaten according to dosha recommendations. I try to omit eggs from my recipes wherever possible, and offer substitutions when I know they work. Many of my recipes are helpfully tagged "vegan", as this omits eggs and dairy. The purpose of this site is to offer international vegetarian recipes with recommendations of how to adjust the ingredients to best suit the doshas. I hope you find some of these tasty and helpful if you choose to try them! Just another little addition to my response to Yogi Maha Jai Shanti, in my recent visit to an Ayurvedic practitioner, the list of dietary allowances she provided indeed included eggs and onions, as well as fish, chicken and meat. My deduction from all this would be that there are degrees of "purity" in how we follow Ayurveda, from the strictest to-the-letter lifestyle including specific sadanhas with goals of enlightenment, to simply doing what we can in the context of our modern lifestyle. The choice is ours as individuals. ONIONS AND GARLIC ARE INTE TAMAS AND RAJAS QUALITY. I am from South Africa, and have studied a lot of Ayurveda altho I'm a Yoga Therapy teacher by profession. Ayurveda has nothing to do with vegetarianism, gunas etc - this is a yoga thing! Onions/garlic make the mind race so meditaiton cannot happen. Meat/chicken/fish etc is used in Ayurveda therapeutically. All this said I am a vegetarian but take milk products. Hope this clears it up! I've just recently written an article about onions and garlic, etc, from an Ayurvedic perspective for confounded visitors to take solace in. I don't subscribe to ayurveda, I just cooked the recipe because I like the taste of carraway seeds! Sugar was added, due to my sweet tooth, and the result was thumbs-up all round. May I ask why this recipes is tagged as "vegan" when it has eggs in it? The discussion is interesting; and I do understand the concerns of some 'purists'...But Please people, if you don't agree about certain foods, just don't eat them! And God Bless Fran for such a wonderful, helpful site! !